Dr. Oz is giving away a few signed copies of his book “Food Can Fix It”. Want to win your copy? Enter the Sweepstakes by October 3rd and you could be one of the 10 lucky winners. The Dr. Oz Food Can Fix It Sweepstakes is open to all legal residents of the 50 United States (including the District of Columbia) who at time of entry are at least 18 years of age. The Promotion Period begins at 9:00 AM ET on September 26, 2017 and ends at 08:59 AM ET on October 3, 2017. Limit one entry per household/person/email address during the Promotion Period. Sponsor will conduct a random drawing to select 10 winners who complete the online entry form during the Promotion Period. 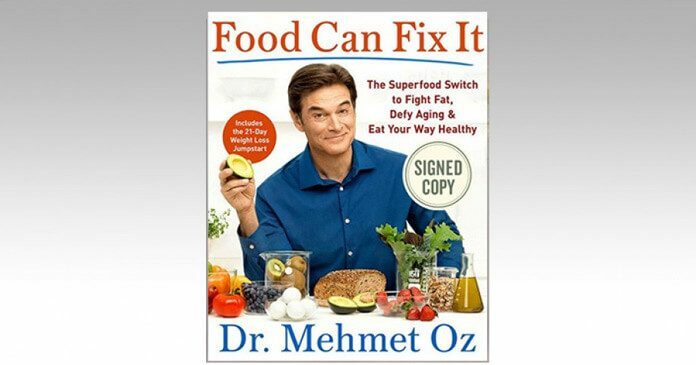 Each winner will receive one signed copy of “Food Can Fix It” by Dr. Mehmet Oz. Each Prize has an Approximate Retail Value of $29.99. Total ARV of all Prizes is $299.99. To view the list of winners, please visit http://www.doctoroz.com/Dr_Oz_Winners_List. ZoCo Productions, LLC, 125 West End Avenue, 7th Floor, New York, NY 10023.